Gujarat PGCET 2018 (गुजरात स्नातकोत्तर सामान्य प्रवेश परीक्षा): The Admission Committee for Professional Courses will conduct Gujarat Postgraduate Common Entrance Test for the admissions in M.Tech courses. The students can apply online for the GUJCET Application Form 2018. The form submission will start to form the month of June/ July. The aspirants have to submit the form to take part in Gujarat M.Tech Admissions 2018. The aspirants who have qualified the GATE Exam will be exempted from any entrance test but they have to submit the application form for the admissions. The authorities will activate the link on their official website. The students have to submit the Gujarat PGCET Application 2018 on the official website. The last date for the submission of the form will be in the months of July. The students who will submit the form successfully only they will get eligible for the admissions process. We will provide here the direct link for the submission of the GUJ PGCET Registration. The aspirants just have to follow some precise procedure for the submission of the form. The forms will be available only in the online mode. The students have to check the eligibility criteria before applying for the form. Steps to submit the Gujarat PGCET Application Form. Then they have to click on the M.Tech admissions from the left side of the page. Now select the notification of PGCET online application. Enter all of your personal details in the form correctly and carefully. Now attach the required documents, photograph and signature along with the form. The students have to pay rs. 1000 for the application form. The fees will be paid through any of the online banking modes. 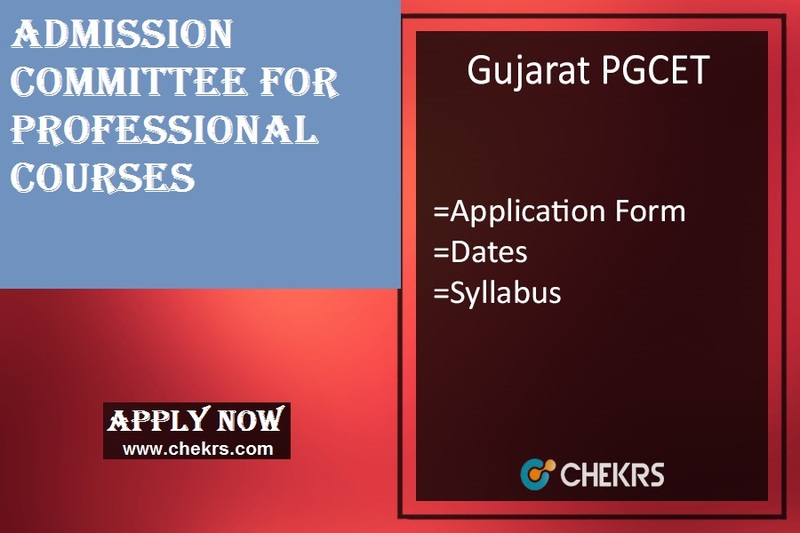 The aspirants have to check the Gujarat PGCET Eligibility before applying for the online form. The criteria for the Non-GATE and GATE students is different. The student must be an Indian citizen. The half of the seats are reserved for the Gujarat domicile. The students must have passed Bachelors in Engineering with required discipline from any recognized University. They must have scored minimum 50% marks (40% for SC/ST) in the qualifying exam. The GATE Qualified students can also apply for the admissions, they are exempted from any type of entrance exam. The students have to check the exam pattern for the exam so that they can get information about the number of questions and duration of the exam. The authorities will conduct the exam in offline pen paper based mode. The students have to follow the below-given exam pattern to qualify the exam. There is no negative marking in the exam and that’s a good news for the students. Due to this, there will be a lot of competition in the exam so the aspirants are advised to be prepared in the better way. The Gujarat PGCEt exam will be conducted in the month of July. So there is very less time remaining for the students for their studies. 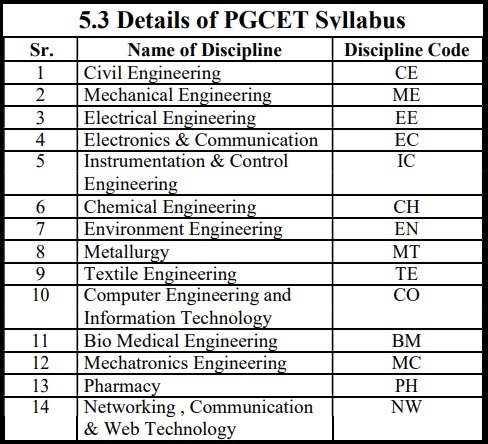 They are required to check the Gujarat PGCET Syllabus Pdf so that they can prepare according to the topics of the exam which will be asked in the exam. The admissions will be based on the marks obtained by the students in the entrance exam. The syllabus for M.tech admissions will include the topics form the respective stream and also the general subjects which they have studied in their B.tech. The list for the streams for which the aspirants can apply and check the syllabus is given below.